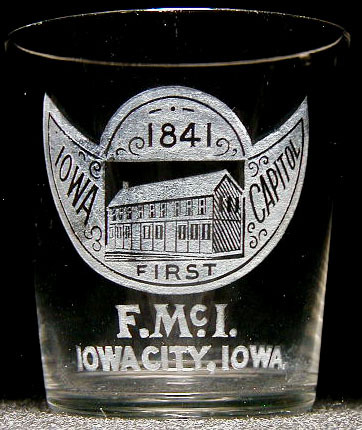 Inscription: 1841 / IOWA (slant down) FIRST CAPITOL (slant up: above middle word is a picture of a building. All text tsp on a frosted crescent design, with curlicues around text) / F.Mc.I. / IOWACITY,IOWA. Dimensions: 2-1/4" x 2-1/16" x 1-9/16"
Condition: There is a broken-out bruise/chip in the rim at rear right and the label is a little patchy in places, but nice overall!